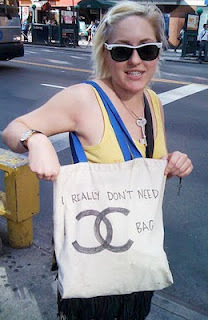 Why drop three thousand bucks when you can make much more of a statement with this "Chanel" bag! It just goes to show you at the end of the day, so much about style is just attitude. Thanks again, doll, for letting a total stranger take your picture for a blog you've never heard of!